We use technology in almost all the work we do. Whether it be in our workplace, or in our home, technology is what makes our life more comfortable and more manageable. The question is, do we know how to use these technologies enough to be an asset in our workplace and become a contributor to the change we want to see in the world? We’re in the 21st century where technical skills are highly in-demand in any workplace. To invest in such skills can give an individual a huge advantage to find new job opportunities, career change, company promotion or professional development. In 2016, Pew Research Center surveyed “The State of American Jobs,” and found that 87% of workers believe that for them to keep up with the changes in the workplace, they need efficient training to develop new job skills. 1) As technology becomes integral to practically every profession, from doctor to marketer to mechanic, how would you characterize your tech literacy in the workplace today? From the discovery of fire to the invention of the wheel, and now to the innovation of self-driving cars and artificial intelligence; it’s evident that nobody can stop the progress of technology. Albert Einstein once feared the day when technology surpasses human interaction and that we’ll have a generation of idiots; looks like that day is just behind our doorsteps. Because as technology advances, we get more uninterested in learning and concentrate on just using. 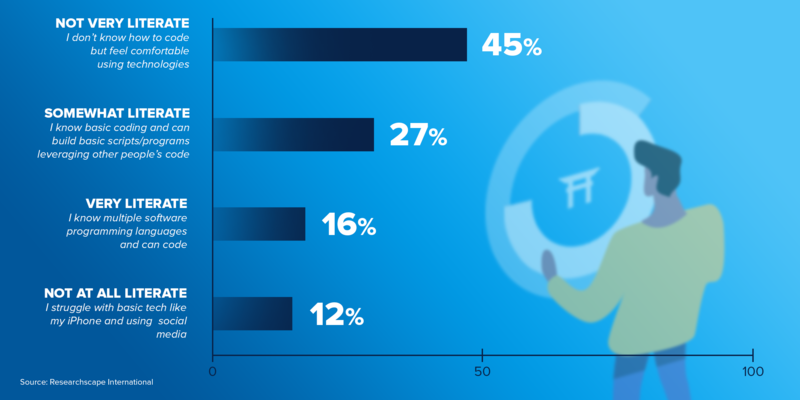 The graph above shows that although many of the respondents are comfortable using the technologies we have, only a small percentage of the respondents consider themselves as literate when it comes to technology. So what does this data imply? We should do our best to keep up with technology, or else, instead of us controlling the technologies we have, we might be the one controlled by them. Technology is the tool that empowers us to create the change we want to see. It provides hope for a better and brighter future. As Jacques Ellul said, efficiency on modern technology is the defining force of new social order, and it is imposed on all human activity. 2. Do you think employers are preparing workers adequately with respect to teaching future-forward tech skills? The future of companies lies in three things: Clients, Management, and Workers. These are the foundations of a strong organization that if one collapses the others fall too. As the brain of any business organization, the management is at the uppermost level of the company’s hierarchy. Its main priority is to satisfy their customers with their outstanding services and high-quality products while their primary responsibility is to manage their employees well, promote their welfare and provide training workshops for their development. As a support, the World Economic Forum in 2016, mentioned that educational training and changes in learning environments are vital to help people stay employable in the labor force of the future. On the survey conducted by Researchscape from May 26 to May 28, 2018, questions about the application of tech literacy empowerment in the workplace were raised. Let’s look at the illustration below on how people respond to the subject. Out of 2,339 respondents, only 2,130 answer question number two from the list. Surprisingly, out of 91% surveyed population who answered that specific question, 56% responded that employers are NOT preparing workers adequately in teaching future-forward tech skills. Conversely, 44% of the respondents believed that companies and employers were providing their employees with sufficient training and knowledge in technological skills. In general, more than half of the sample size sounded unsatisfied with companies’ concern for their workforce’s growth and development. It would be better if companies look into it and do something to update their staff’s tech skills. 3. What Should Employers Do To Empower and Support Workers When It Comes To Tech Literacy? Based on the results of the survey above, 39% of the respondents wanted incentives for individuals who enlist in coding bootcamps or other tech training workshops outside of work. Next in line, with 36% of the respondents, is the employees need for more interaction or communication between tech and non-tech workers to encourage understanding of each other’s jobs. Giving employees the time to communicate with each other strengthens the worker’s relationship to have better teamwork, and even improve their performance. The fourth on the results can also be a way to let the employees communicate with each other. With 33% of the majority, there is also a need for hosting fun events that make tech learning fun, one of the examples is coding your own emoji. A coding bootcamp is a great place to learn how to code. When it comes to coding bootcamps, Coding Dojo is the bootcamp to be. We offer three full stacks and six of the most in-demand programming languages in 2018. We have an Onsite Bootcamp and an Online bootcamp for those who have a full-time job and also for students who can’t join the Onsite bootcamp. Whether you have or don’t have a coding background, everyone is welcome to join the program. Come and join us! Visit https://www.codingdojo.com/ for more information. Also, you can check out this Coding Dojo Video here.